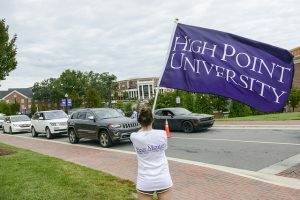 All incoming students at High Point University will be assigned a Peer Mentor. Peer Mentors are sophomores, juniors, and seniors who have volunteered to assist new students in their transition to HPU. This student serves as a familiar face on campus who offers support and guidance to new students. students and transfer students and pairs them with an upperclassman. Peer Mentors are undergraduate students (sophomores, juniors, and seniors) who apply in the spring to be accepted into the program. These students offer advice, respond to questions, and provide information about campus life and resources to their mentees. Peer Mentors coordinate small groups, usually around 10-15 incoming first-year students. Peer Mentors also guide new students through Welcome Week, filled with activities to get acclimated to campus and learn about HPU. Mentorship provides a great opportunity for students to get to know one another before coming to HPU, make friends with one another, and make the transition more smooth. Peer Mentors are expected to maintain contact with their mentees through the first six weeks of the semester. For many mentors, their connection with their mentees extends beyond the fall semester and they remain friends and resources throughout their time at HPU. If you have any questions about the Peer Mentor program, please feel free to contact Crystal Crouse or Scott Wojciechowski at 336-841-9231. You can also send an email to peermentor@highpoint.edu. The application process will begin in Spring 2019. Information will be posted on HPU Connect.